I remember this time last year. I was just weeks away from starting college/6th form. I was incredibly nervous because it's a new place, new people, new type of education. One thing I struggled with this time last year, was lack of preparation. I searched the internet for blog posts, YouTube videos and much more, in an attempt to prepare myself for what college would be like. 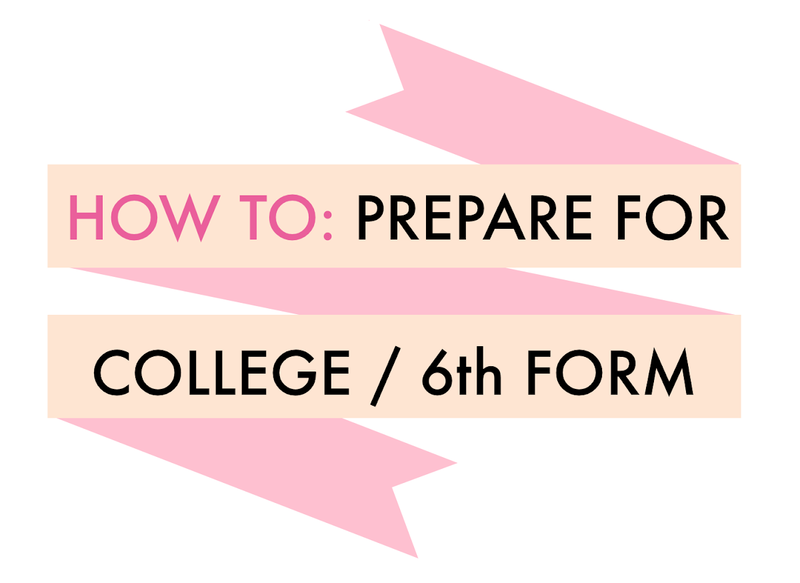 So now, after a year at college, I can share my advice on how to prepare for 1st year for any 16-year-olds heading up to the next level of education. Notebooks: You will probably need a notebook for every subject. Therefore, if you're doing 4 subjects, you'll need 4 notebooks. Personally, I took art as one of my subjects, so I only needed 3 notebooks as there wasn't much to write down for art. At my college, they prefer A4 lined paper with a left margin. This paper makes things look neater and easier to mark. Pens, pencils, ruler and other basic equipment and suitably in a pencil case. You don't need a pencil case, but they do help collect all your stationary together. Also, for exams, you can take a clear pencil case. Folders: Again, you could need one of these for each subject. However, I wouldn't advise that you buy one of these before college. It's more sensible to keep your notes all together in their own notebooks and, as you get used to your subjects a few weeks in, re-evaluate whether you think you'll need a folder. For example, I didn't need a folder for Media Studies because we weren't given many handouts, and all notes could be made in my notebook. However, for Literature, I studied many different texts which meant my notes needed sectioning. Lastly, I got a lot of handouts for Language which needed to be collected and sectioned into a folder. This is a great way save oneself from unnecessary spends. Bag: You will need a bag! And it will need to be a decent sized bag. I recommend a bag that will fit A4 paper in, as well as lunch and other stuff. I have a little bag inside my bag which includes a bunch of emergency 'lady goods'; from lipstick, hand cream, sanitary towels, painkillers and moisturiser. These things definitely don't come in wrong and it's handy to keep them all in a little bag/purse. I'd recommend that you look at your wardrobe and collect together a handful of staple pieces that are suitable, quick, and easy for college. For me, it was dungarees, a few pairs of shoes, jeans and casual tops, a few dresses and skirts. These items could be matched together in all different ways to form all different types of outfits. Don't go overboard. You don't need to go out and buy tonnes of fancy clothes because, once everyone is stressing about their work, nobody actually takes notice of what you're wearing. You probably need a minimum of 7 outfits. But, it's all entirely up to you - if you want to splash out, then go ahead! In my college hair dye, nail varnish, makeup, earrings and mobile phones are all allowed to some extent however, make sure you check on this. In the first few days of college you'll either be told or just pick up from the people around you whether these things are allowed. My advice would be to ask others and be prepared to be told what is and isn't allowed. Anyone like me who struggles going into new situations and places with strangers, will inevitably be apprehensive about starting 6th form. If you can mentally prepare yourself appropriately, you can make this easier. Firstly, use all the above prep to make your life more organised and simple; this way, you won't have to worry about your equipment or appearance. Once you've done that, recognise that you'll be meeting new people and undertaking 'ice breakers' and team building exercises. Luckily for myself, I went to college with a lot of others from my secondary school, but not everyone does. In both cases, you should prepare for making friends. For example, write down 5 things that you know about yourself. Perhaps: 'I have a cat called April', or 'The last holiday I had was Iceland'. Setting these things out helps you prepare for new conversations with new people. And of course, you have to remember that everyone is in the same position as you. You may believe that you will be the most nervous, or struggling the most; in that case, take things slowly, listen to others and be yourself. If you're struggling at college: TALK! There is staff there, parents/carers at home, and friends around you. Everyone is allowed to make mistakes and everyone is allowed to not know everything. As with friends, be prepared to make and lose. My advice is to stay with positive people who make you feel secure and happy. Whether that's your current friends, or a fresh new set - let yourself flow into the right friendship group. And you can achieve this by ultimately being yourself. Lastly, be patient. I struggled a lot in my first months of college. I didn't like the difficulty of the work, the fast pace, and sheer responsibility. But, I persevered and used a lot of patience. Eventually, after Christmas, I was fortunate enough to make a fantastic group of friends, feel more confident working around college, and easier to hold responsibility. I'm definitely not saying that college is easier, a joy, or my favourite place - it just seems more bearable with a clear mind of feeling settled and comfy due to patience and perseverance. I wish I was given this information when I was starting college, because it would've definitely helped me.